Rwiringa asked the Answer Line forum how to save an entire Web page, including images, for off-line viewing. You've got a number of options here. The first is to do just that: Save the page and its image files. And the current versions of most browsers make this very simple. In either Firefox or Chrome, press CTRL-s to bring up the Save As dialog box. In the 'Save as type' field, select Web Page Complete, and save the file to your desired location. If you're using Internet Explorer, select Page (near the upper-right corner), then Save As. In IE, the ‘Save as type,' menu offers two "Webpage complete" options. You want Webpage complete (*.htm; *.html). When they save the page, all three of these browsers create an .htm file, plus a folder containing all the necessary images. The code in the .htm file has been altered to look for image files in that folder. The result isn't always perfect, and heavily coded pages may not render properly. I tried several pages from pcworld.com, and found various images missing, although the ones you'd most want--those that are part of the editorial content--were there. Another problem with this method: If the .htm file and the folder get separated, or if you change the folder's name, the page won't find its images. 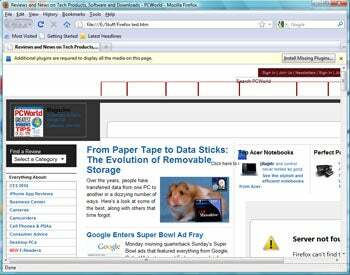 Internet Explorer offers a one-file solution that gets around this problem: Web Archives. To create one, select Page, then Save As. For ‘Save as type,' select Web Archive, single file (*mht). Now you know why IE offers two Web Archive options. These archives aren't perfect, either. You can only view them in Internet Explorer (a serious problem if a Linux user must look at them), and they still drop a lot of images. The final solution is to save the page as a .pdf file. These files are compact, don't have to travel with a folder of images, can be read with a free reader that almost everybody has, and include all of the images on the page. But how do you convert a web page to a .pdf? There are plenty of programs available that can do it for you. Many of them install as print drivers, so that anything you can print can be converted. I'm currently using the free Bullzip PDF Printer, and see no reason to change. But there's an even easier way to convert a Web page into a .pdf file. Copy the URL to the clipboard, go to pdfmyurl.com, paste the URL into the appropriate field, press ENTER, and save the file. My thanks to forum regular Oldschooljohnny for introducing me to pdfmyurl.com. You can read his comment and others in the original forum discussion.